Released from the burden of originality and the guilt of self-indulgence, here is my own To Do List for first-time visitors to Venice. Whether you arrive in Venice at Santa Lucia railway station, at the bus depot in Piazzale Roma, or at the small airport across the lagoon, the glorious Grand Canal will be among the first sites you see, and invariably, it will look exactly as you imagined. It will feel at once foreign and familiar, as if you’ve stepped into an 18th century painting by Canaletto, only to find that the world around you has changed little in its substance. To extend the illusion a little longer, board a public water bus—known as a vaporetto—and ride it the length of the canal, under the Rialto Bridge, by the colorful and crumbling façades of grand palazzos like the Ca’ d’Oro and the Ca’ Rezzonico, all the way down past the dome of Santa Maria della Salute, before disembarking at St. Mark’s Square. If the Grand Canal seems heavy with traffic today, bustling with motor boats, water buses, and gondolas, remind yourself that it was even more crowded in the 16th and 17th centuries, during the golden age of the Venetian Republic, when it was a major thoroughfare for merchants who traded goods across Europe and the Far East. BUYING TICKETS: ACTV tickets can be bought: 1) Online; 2) On site from the Hellovenezia ticket office at the railway station; or 3) From the automatic ticket machines on some landing docks. COST: A single ticket on the vaporetto costs €7, so buying a tourist travel card is a wise decision. Cards allow unlimited access for a period of either 12, 24, 36, 48, or 72 hours, or for 7 days from the time it is initially activated. Prices vary accordingly, from €18 to €50. For further details, see one of the websites below. NOTE: For the purposes of sightseeing, board a vaporetto on Line 1 (map), or pay slightly more to board the special Vaporetto dell’Arte, which includes a multilingual audio and video system. Remember, you will need to swipe your travel card on the iMob validating machines located at the entrance to the ACTV loading docks before you board, or face a hefty fine. At the eastern end of St. Mark’s Square lies the basilica that was built to house the remains of St. Mark the Evangelist, plundered from Alexandria, Egypt in 828 A.D. Legend has it that the Venetians hid the relics in a barrel under layers of pork to slip them past Muslim guards, a scheme they later depicted in a mosaic above the portal that is farthest left of the front entrance. While Venice is replete with Baroque churches, St. Mark’s Basilica is an exotic outlier, with its massive marble columns, graceful arches, and onion domes clad in lead. Look carefully about and you’ll also see a hodgepodge of ornaments that were brought back piecemeal over the centuries by Venetian merchants who had sailed to the Orient and back. To see the interior—a “glittering robber’s den” encrusted with gold mosaic tiles, set unevenly to better refract the light—you will have to survive the basilica’s infamous queue, as well as its strict rules for entry, but both are a small price to pay for the privilege of seeing one of Europe’s finest churches. GETTING THERE: For directions to Piazza San Marco from various locations, including the train station and Piazzale Roma, click here. HOURS: Summer hours for the basilica are from 9:45 AM – 5:00 PM weekdays and Saturdays, Sundays and holidays from 2:00 PM – 5:00 PM. Please check the website below for hours at other times of year. NOTE: Modest dress is required (cover those knees and shoulders!) and photography is not allowed, nor are large bags and purses. To avoid the maddening queue to get in, consider making a reservation online. 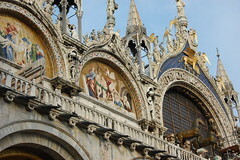 COST: Admission to the basilica itself is free, but small and very worthwhile charges apply to enter the chancel, treasury and loggia, areas which include the Pala d’Oro, a gold altarpiece constructed of enamel icons and encrusted with gemstones; an odd and extensive collection of chalices and reliquaries containing the blood and bones of saints; and the original gilded horses of St. Mark, the prize of so many lootings over the centuries. MORE: If time permits, consider purchasing a Chorus Pass for €12, which grants admission to sixteen churches in Venice. You will see where the most delicate administrative tasks were performed, in an attic space far removed from prying eyes, then you’ll continue through the Chancellery, where walls of cabinets once contained secret documents, before arriving in the torture chamber in which prisoners were hung by their arms from ropes. You’ll even get to cross the infamous Bridge of Sighs and enter the prison itself to see the cell once occupied by Casanova, and from which he made his daring escape. Along the way, be sure to keep your eye out for centuries old graffiti scratched into the window panes by bored clerks. GETTING THERE: If arriving by vaporetto, chose either the Vallaresso or San Zaccaria stop. For more information, click here. HOURS: From April to October, the Doge’s Palace is open daily from 8:30 AM – 7:00 PM, and from April-March, daily from 8:30 AM – 5:30 PM. “Secret Itineraries” tours in English run at 9:55 AM and 11.35 AM and should be reserved in advance. COST: A full-price ticket valid for the Doge’s Palace as well as the Museo Correr, Museo Archeologico Nazionale, and the Monumental Rooms of the Biblioteca Nazionale Marciana costs €16. The “Secret Itineraries” tour is €20. For those tourists who intend to visit many of the city’s churches and museums, purchasing the Venice Card (€39.90 for adults) may be a worthwhile option. 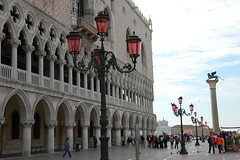 MORE: In addition to the Doge’s Palace,Venice offers an array of enticing museums. If time permits, or foul weather forces you indoors, consider visiting the following: Gallerie dell’Accademia (pre-19th century Venetian art); Peggy Guggenheim Collection (contemporary art); Museo Correr (collections focus on the art and history of Venice); or Ca’ Rezzonico (a museum of 18th century art). While most ancient bell towers in Italy require a sturdy pair of legs, the campanile in St. Mark’s Square has a large and speedy elevator. Ride it to the top for the sheer pleasure of the view. From a height of 324 feet, you can easily see the entire city, with a rim of coastline in every direction. Look for the iconic church of Santa Maria della Salute at the mouth of the Grand Canal. If you scan the red tiled roofs carefully with a camera lens or a telescope, you might also spy the elegant spiral staircase of the Palazzo Contarini del Bovolo. Rest assured, while the original 15th century campanile collapsed into rubble quite suddenly in 1902, the reconstructed tower won’t fall again because Venice recently completed a multi-year engineering project to shore up its foundation. HOURS: Summer hours for the campanile are from 9:00 AM – 9:00 PM. Please check the website below for hours at other times of year. COST: A ticket to ride the elevator to the top of the campanile costs €8. MORE: For another extraordinary view of the city of Venice, take a vaporetto out to the island of San Giorgio Maggiore and take the elevator to the top of the bell tower there. 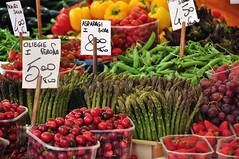 In the morning, the open-air Rialto Market is a feast for the senses, as local farmers and fisherman unload trays of fresh squid, cuttlefish, crabs and clams, as well as baskets of whatever produce is in season, from cherries and grapes to peas and asparagus. If the old adage about eating with your eyes first is true—mangiare con gli occhi, as the Italians would say—you will stroll about and leave feeling very full and very happy. HOURS: The markets open around 7:00 AM. Note, the produce market is closed on Sundays and the fish market is closed on Sundays and Mondays. While the fame of Venetian glass extends back to the Roman Empire, all of the furnaces and foundries were moved to the island of Murano in 1291 out of fear that a fire would consume the city’s wooden buildings. Today, the art, craft, and tradition of Murano glass continues and local boutiques sell a dizzying array of whimsical sculptures and ornate chandeliers. On one of my visits to Venice, the shop window at Pauly & Co. in St. Mark’s Square displayed a series of balloon animals that would surely pass for the real thing, in addition to a green fedora for €7,500, and a folded shirt, complete with buttons, for €8,100. A craftsman even made what would appear to be Cinderella’s glass slipper, although at nearly €11,000 most women would need to marry Prince Charming to be able to afford it. For a far less expensive option and one that’s easy to slide into a suitcase already bulging with Italian souvenirs, shop for jewelry instead. RECOMMENDATIONS: Personally, I like the jewelry collections at Antica Murrina and Le Perle. Here are some other suggestions from Lonely Planet. NOTE: If you spend enough and you’re a non-EU citizen, consider applying for a VAT refund. Eventually, even the most ardent admirer of Venice will want to escape for the day to the nearby islands of Murano, Burano, or Torcello. The first is best known for glassmaking, the second for lace, and the third—I suspect—for being seldom visited by tourists. 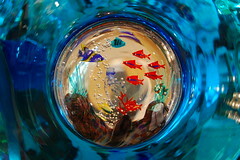 Start with a short boat ride to Murano, where you can any number of glass factorys for a free tour. In the heat of the furnace, the craftsmen work quickly and deftly with molten glass that is roughly the texture of salt water taffy, just be wary of the salesmen who will follow you afterwards into the showroom. They can turn the subtle art of browsing into an uncomfortable, high stakes game of cat-and-mouse. 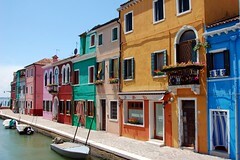 Next, make your way to Burano, a tiny fishing village where the streets are a riot of color, lined with houses that are painted in improbable shades of blue, orange, green, purple, and red. Flower pots rest on window ledges, laundry hangs to dry, and in the summer nearly every front door stands ajar, covered only with a striped curtain that catches the breeze, as a sail might on a boat. If time remains, consider one last jump to Torcello. There is a brick walkway that leads away from the dock, but much of the island consists of open fields and undisturbed wetlands. Follow the path to a cluster of old buildings that includes two magnificent churches side-by-side—Santa Fosca, which is low and round, and the more conventional Santa Maria Assunta, with its solitary bell tower. Both are primitive, peaceful and calm, far removed from the opulence of Venice and its madding crowd. GETTING THERE: The islands of Murano, Burano, and Torcello are easy to reach using public transportation. Vaporetto line numbers 12, 13, 14, 4.1, and 4.2 make the journey to Murano from Fondamente Nove (on the north side of Castello), and line number 12 continues on to Burano and Torcello. Yes, it is cliché, and it is expensive, but you have traveled long and far to come to Venice, and you really should ride in a gondola. 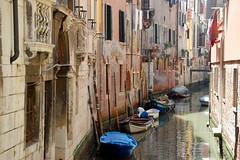 LOCATION: Gondolas depart from nearly every dock in Venice, so wander about and pick a neighborhood that appeals to you. 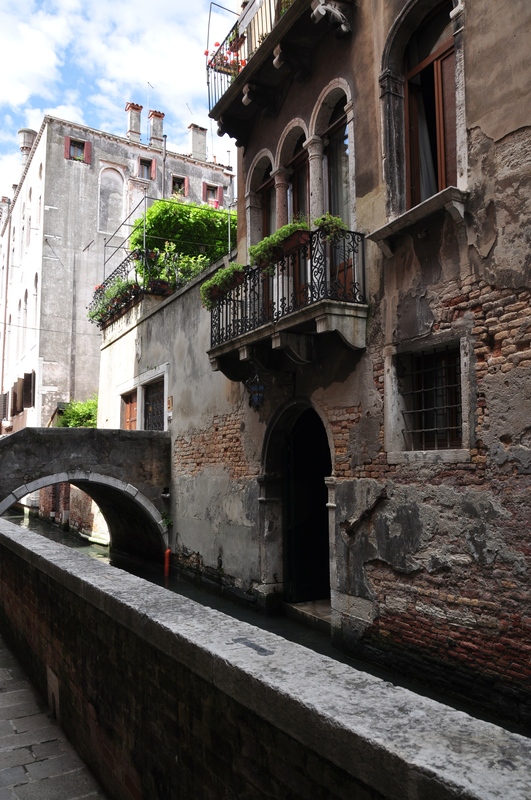 Most itineraries will include at least a short piece of the Grand Canal, but it’s often a ride along the quiet side canals that is most enchanting. 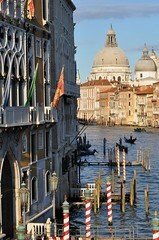 COST: The rates for gondoliers are fixed by the city of Venice. During the day, expect to pay €80 for a 40-minute ride for a maximum of six people, and €40 for each additional increment of 20 minutes. In the evening, the rate increases to a base price of €100. 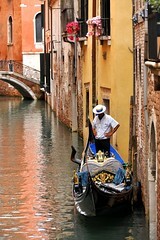 If you would like to be serenaded by your gondolier, that fee is additional and must be negotiated. Too expensive? Here are some affordable alternatives: 1) Share a gondola ride with others at Santa Maria del Giglio; or 2) Take a traghetto across the Grand Canal. For a list of crossing points, click here. It’s said that when Casanova escaped from prison in 1756, he stopped off for a cup of coffee at Caffè Florian before fleeing to Paris. It’s easy to understand why when you see how lively and pleasant Piazza San Marco becomes at night, once the crowds have slipped away. 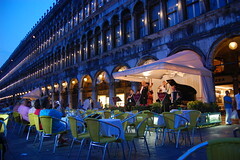 There are three restaurants in the square, each with neat rows of tables and chairs, and awnings under which an orchestra plays. Take a seat at Caffé Florian, Ristorante Gran Caffé Quadri, or Caffé Lavena, order a cocktail, lean back and relax as you are serenaded with sentimental waltzes and lively folk dances. No one will blame you if you get up and dance. NOTE: To avoid an unhappy surprise when the bill arrives, please know that there is a supplemental charge per person whenever the orchestra is playing. In a city built of islands, where there are 150 canals and 400 bridges, maps are of little use, and modern gadgets like cell phones with GPS, even less so. For that reason, it can be genuinely difficult to find things in Venice, so resolve to discover them instead. The lack of intention makes all the difference in the world. It allows frustration to give way to serendipity. In exploring the city’s labyrinthine streets and canals, you may find comfort in periodic signs that read “Per Rialto and “Per San Marco,” but notice how they often they point in two directions at once, creating endless combinations. Follow your fancy and see what pleasures await. On one of my tramps around Venice I was treated to shop windows that had exotic spices stacked into powdered pyramids, papier-mâché masks formed into the fanciful faces of cats, hedgehogs and owls, and tiny gold fish suspended in blown glass aquariums of every size and shape. Walk on, and soon you’ll find yourself wondering what more there is to see just around the corner, and you’ll be tempted to devote the entire day to finding out. 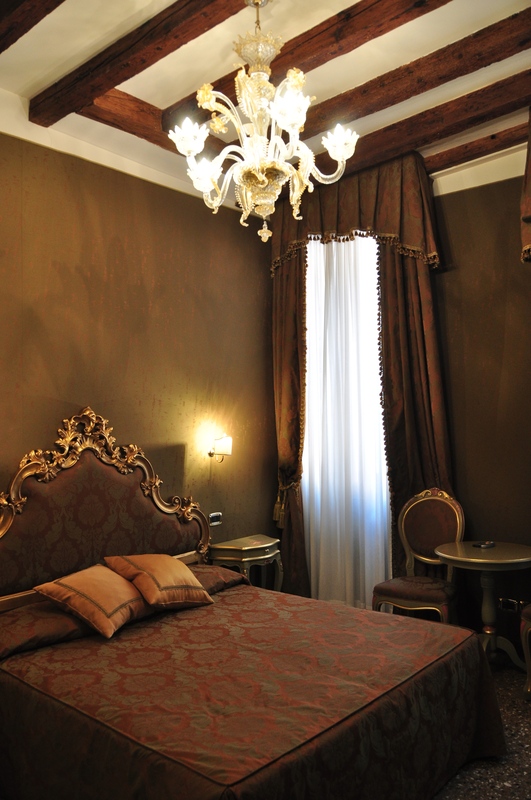 My personal choice is always the Hotel Al Ponte Mocenigo at Santa Croce 2063, but don’t just take my word for it. Check out their reviews on TripAdvisor. Thank you so much for this nicely worded list, and also for the attached links. The kindness of bloggers like you makes a trip for the rest of us so much easier to put together! You are very welcome. I hope you had a wonderful trip! Some cities, and even some airports, have “pod” hotels that rent rooms by the hour, but I’m not aware of anything like that in Italy. Perhaps you should post your question to a larger online travel forum, like TripAdvisor or Fodor’s. Someone there may be able to help. You might try AirBnB.com. 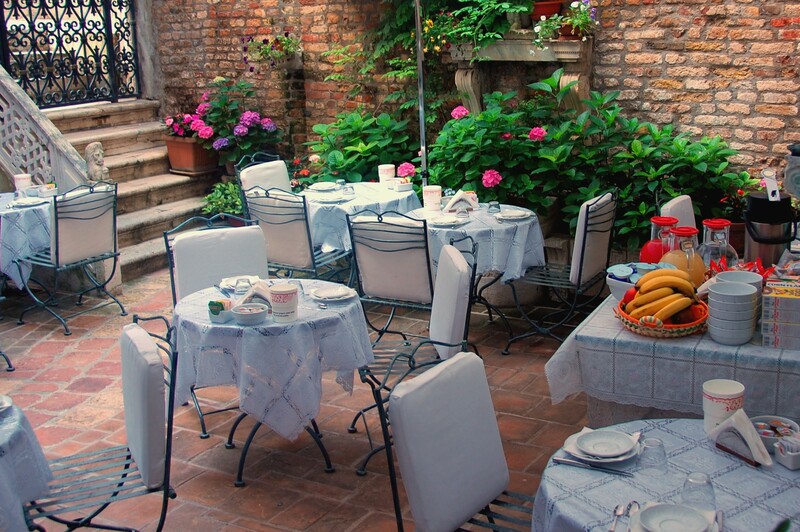 I’ve had good luck using them to secure inexpensive lodging across Europe including Venice. Good luck! I am interested in the “secret itinerary” tour at the Doges Palace. Do I also need to buy a regular ticket for the Palace as well? Thanks so much for your information. It is definitely helpful for my trip with my boyfriend to Venice next month. You are quite welcome, Olivia. I hope you have a fantastic trip! Do you have a similar list for Florence, Tuscany, and/or Rome? You’re list for Venice is so incredibly helpful!! Hi Deborah, Thanks for your sharing your insignts about Venice< i will use them for my visit in July, However could you please suggest an itenary for Paris? Hello everybody, anyone of you could give me some tips to find some nice wine bar in Venice? Ciao Sharon! I’m just back home, I’ve been in Venice with a group of friends last week… I won’t spend too many words to say how obviously I loved the city and its magical athmosphere, and how deeply I envy you and all the people still there… :) but I’m just telling you this: if you are looking for a nice relaxing walk and a couple of glasses of wine, leave the map in your room, and try this tour here: http://www.venicewinetour.com/ . We had a very good time with them, the food and the wine of course were delicious… definitely one of my best experiences there. Thanks for the tip, I really love wine and this tour sounds very interesting, can’t wait to try it out! Hello Sharon, we did the tour you mentioned, the one with five wines and the gondola ride. Our guides were wonderful and very knowledgeable. Such great value for money, I can’t think of a better way to spend an evening with in Venice. Great post! I didn’t know about the three islands when visiting Venice and it would have been nice to escape the busy city. The orchestras in San Marco are beautiful musicians. And we, for sure, put down the map and got lost. A lot. Great place to visit!! Bartolucci’s is at San Polo 46, near the Rialto Bridge. Yes, there are a services of personal shopping in Venice. Personally i’ve tried this one http://www.personalshoppervenice.com . They are specialized in brands, luxory handcrafts and wines. It wasn t cheap at all but a great value for money, the guide was very knowledgeable and took me to the best shops of the city. Hi. I am planning to visit Venice at the end of October 2014. Weather-wise is it worth it or is it to cold ?? Hey Deborah, love your writing. 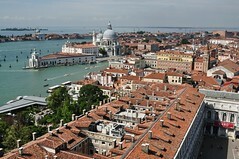 I am going to Venice in June for 3 days reaching there from Milan. I have created an itinerary for my 3 days in venice with an itinerary planner at http://www.triphobo.com/venice-trip-from-milan-5465d3030c1d0afa6d00005f, I have also done my bookings from there, I hope everything goes as per the plan and I can enjoy my first trip to Venice :) Tips in this blog are an addition to my knowledge about Venice, making my planning task much easier, thanks so much for sharing this. There are little more than 10 attractions in Venice but you really collected most interesting of them, I also can suggest to download sightseeings map of Venice from http://www.itouristmaps.com/italy/venice/ and follow all points during the trip to this fantastic city on water. Hi Deborah, I love your blog. There are just two things I’m confused about and hope you can help. I booked the clock tour through Viva Ticket and it says collection is at box office. I’m sure you’ve been through this before. Do they mean Viva Ticket has their own box office or is there one at the Clock Tower. Same with Prebooking the Peggy Guggenheim through them. Last question- I ordered the VeneziaUnica card for museums and am wondering where I can redeem my voucher for the card. I’ve really tried to look through the websites but just get more confused. This was so incredibly helpful, especially the costs and times of day each place is open! I appreciate it so much! I just came back from Venice a couple of weeks ago! I would like to provide some tips about things to do/try or not once you are there. About the ice creams, give a try to Grom and Venchi (close to the central square), probably the best gelatos you could find in Venice. About wines, probably the best way to have a complete overview about the local wines would be taking a tour about wine and food tasting (we found a very good one here tastingvenise/com). If you want to buy some artisanal masks go to CaManana in Dorsoduro, please don’t buy those stupid plastic masks close to the Railway Station. Sorry the shop of the masks is CaMacana (www/camacana/com), just change the / with a dot. The same for the link of the tour above (www/tastingvenise/com). Venchi does not have a direct link, but you can look in TripAdvisor or Yelp to find it. Another golden tip: avoid the Harry’s bar if you can, high prices and poor quality! Thanks Deborah for such a wonderful list with all the required details. The most helpful blog that I have come across. Keep writing & sharing. Do you have information on train tickets from Venice to Florence, Florence to Rome and Rome to Venice and how far away to book tickets in advance to avail of discounts if possible. Thank you.